It’s written in our DNA. Our genes are what define us. Everyone’s DNA make-up is different. The variations in our genes make us unique from one another. This is why we all look different, and why our bodies all respond to food and nutrition differently. It’s becoming apparent that there is not a one-size-fits-all approach to food and nutrition, and the reason may lie in our genes. More is becoming known about how our genes affect our health and well-being. A good example of this is the genes that predispose someone to Coeliac Disease – over 99% of people affected by the disease have one of both of the HLA DQ2 and HLA DQ8 genes. Research tells us that one of the most important lifestyle factors affecting your likelihood of developing certain diseases is food and nutrition. It really does have a significant impact on your overall health. Since the completion of the mapping of the human genome in 2003, there has been much research looking into if and how food affects our genes, with growing recognition of how our genes influence our health. Our genes are made up of DNA, and our DNA is made up of four chemical bases, pairs of which form the “rungs” of the twisted, ladder-shaped DNA molecules commonly seen in DNA models. All of the genes in our body are made up of stretches of these four bases, arranged in different ways and in different lengths to form different combinations. Our genes altogether are known as our ‘genome’. Through this research we now know there are about 25,000 human genes, of which virtually all can exist in different forms. There are roughly three billion DNA base pairs which make up the entire sequence of the human genome. The director of the National Human Genome Research Institute highlighted the importance of this project saying it’s “an incredibly detailed blueprint for building every human cell” and “will give health care providers immense new powers to treat, prevent and cure disease”. It has paved the way for fascinating research and created a whole new area of study called Nutrigenomics. Nutrigenomics is the study of how diet interacts with genes to impact on health and performance. It is the science that uncovers the relationship between genes, nutrition and human health. Different versions of a gene can make us respond differently to certain components in food such as the gluten in bread or the caffeine in coffee. These variations can help to explain why some people are at higher risk of vitamin D insufficiency or low iron status. Since the completion of the Human Genome Project, we have learnt that genetic variations in the population and between individuals can affect a wide variety of responses to key components of the human diet, such as vitamin A, vitamin C, omega-3 fatty acids, and protein. For example, while some people can happily consume foods and drinks in line with our Australian Dietary Guidelines, others may benefit from limiting their caffeine consumption or increasing their intake of omega-3 fatty acids. The best diet for you will depend on your specific variants for these nutrition-related genes. Understanding your genetic profile can provide you with insight into how your genes affect your unique response to the food and drinks you consume, and can provide you with the tools needed to make the best dietary choices. Depending on which genetic test you choose to have done, testing is completed by either the company Nutrigenomix or MyDNA. 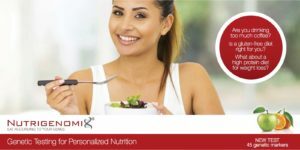 Nutrigenomix genetic testing. Analyses 45 nutrition-related genes. Our dietitian will collect a saliva sample using the Nutrigenomix genetic testing kit. This is then sent off to the Nutrigenomix laboratory where they analyse the sample and provide a written report of your results, which is explained to you in detail by your dietitian. MyDNA. Is an Australian DNA testing company that analyses 7 nutrition-related genes. These test kits are available to purchase from our clinic. You collect your own sample using the MyDNA test kit, which is then sent off to the Melbourne laboratory for analysis. MyDNA then provides a written report of your results which only you can access. If you need help implementing dietary changes based on your results, our dietitian can provide you with additional support and practical recommendations. Knowing how specific genes can affect your response to different dietary components helps you to use nutrition to it’s fullest potential to prevent, manage or improve various health issues and chronic disease. This kind of testing does certainly not dismiss or contradict our Australian Dietary Guidelines. Rather, it can be used as a supplement to help transform the recommendations in the Guidelines into more specific advice on the amounts of protein, fats, vitamins, minerals and other dietary components you should be consuming in order to optimise your health and well-being. Research has shown that giving people this kind of information about their genes can motivate them to adopt healthier dietary habits. WHY IS MY DIETITIAN PROVIDING GENETIC TESTING? Our dietitian has completed a Bachelor of Science (majoring in genetics), prior to completing her Master of Dietetics. She is well-versed in all things food, nutrition and genetics, and is therefore the best person to see in order to help you interpret your results and make a plan for you moving forward. 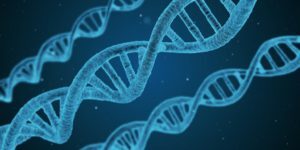 Not only does our dietitian Sarah have a major in genetics, but she was undertaking this qualification when the Human Genome Project had just reached its completion and as a result this was a significant area of interest and personal learning for her. Contact us to book in a test today!